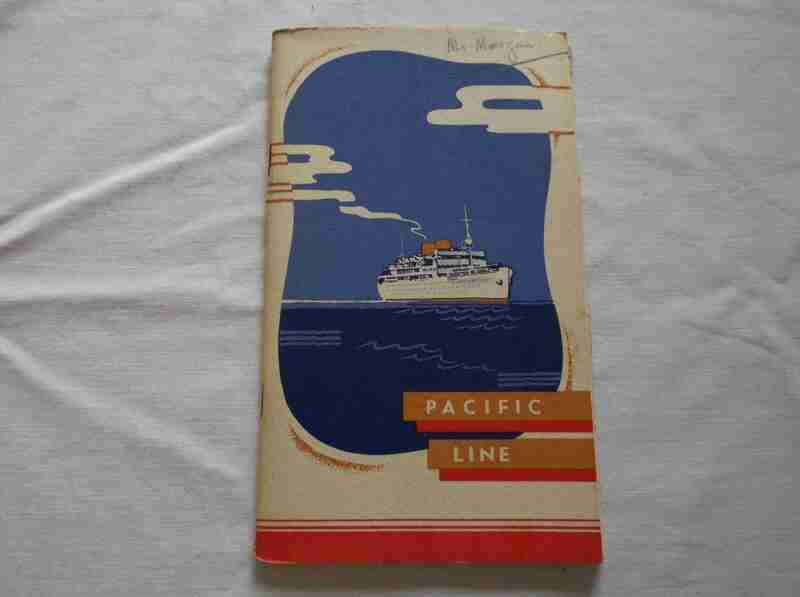 DESCRIPTION -- Ships cruise passenger information booklet and passenger list for the Pacific Line vessel The Orduna which is dated 3rd January 1939 and is for a ships cruise sailing from Liverpool, England. It covers a great deal of information about the cruise for the passengers, as well as a full passenger list. HISTORY -- The Pacific Steam Navigation Company was a commercial shipping company that operated in the Pacific coast of South America, and was the first to use steam ships for commercial traffic in the Pacific Ocean. The company was founded by William Wheelwright in London in 1838 and began its operations in 1840 when two steam ships Chile and Peru were commissioned to carry mail. Early ports of call were ValparaÃƒÆ’Ã‚Â­so, Coquimbo, Huasco, CopiapÃƒÆ’Ã‚Â³, Cobija, Iquique, Arica, Islay, Pisco and Callao. In 1846 the company expanded its routes to include Huanchaco, Lambayeque, Paita, Guayaquil, Buenaventura and Panama City. DESCRIPTION -- Early ships item from the Pacific Steam Navigation Company which is an old as used on board 'pastry cutter' from the bakery department. The item is silver-plated and shows on the side a belt design with the company name and logo with the size of this piece as 3" ( 9.5cm) across and is in a great condition. HISTORY -- The Pacific Steam Navigation Company was a commercial shipping company that operated in the Pacific coast of South America, and was the first to use steam ships for commercial traffic in the Pacific Ocean. The company was founded by William Wheelwright in London in 1838 and began its operations in 1840 when two steam ships Chile and Peru were commissioned to carry mail. DESCRIPTION -- Ships cruise passenger information booklet from the Pacific Line vessel The Orduna which is dated 28th March 1939 and is for a ships cruise sailing from Liverpool, England. It covers a lot of information about the cruise for the passengers as well as a full passenger list. HISTORY -- SS Orduna was an ocean liner built in 1913-14 by Harland & Wolff in Belfast for the Pacific Steam Navigation Company. After two voyages she was chartered to Cunard Line. In 1921 she went to the Royal Mail Steam Packet Company, then being resold to the PSNCo in 1926. Her sister ships were the RMSP Orbita and SS Orca. She provided transatlantic passenger transport, measured approximately 15,500 gross tons, and was 550.3 ft x 67.3 ft.